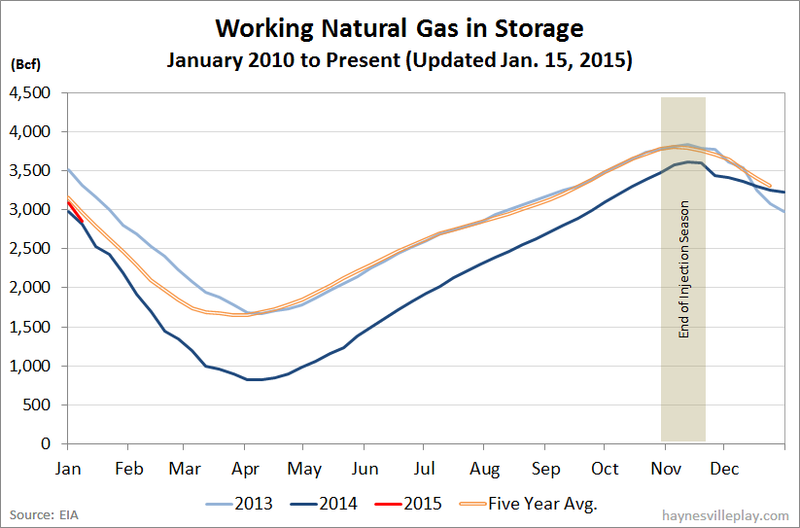 The EIA reported this morning that working gas in storage was down 236 Bcf to 2.853 Tcf last week. The weekly withdrawal was 12% lower than last year (-268 Bcf) but 24% greater than the five year average (-190 Bcf). The current storage level is now 11.0% above last year (2.571 Tcf, a difference of 282 Bcf) but 3.8% below the five year average (2.966 Bcf, a difference of 113 Bcf). Temperatures across the Lower 48 last week averaged 34.7 degrees, which was 0.7 degrees cooler than last year and 0.9 degrees warmer than average. It will take me a couple of days but I will update map when I update rigs.